Gretchen Wilson (Country Music female artist) Jams With Heart. If receiving four Grammy nominations and winning two Billboard Music Awards wasn't enough to make a great week, Gretchen Wilson had a lifelong dream come true when Ann and Nancy Wilson (no relation) of the legendary rock group Heart joined her on stage at the House of Blues in Las Vegas December 8. Gretchen Wilson impressed the rockers when she traded vocals with Ann on the classic hits "Barracuda" and "Straight On," while Nancy Wilson jammed on her trademark guitar licks. "This was beyond a dream come true for me," said an elated Gretchen Wilson. "I sang Heart songs in cover bands, but I never thought I'd actually be on stage with them!" Gretchen Wilson picked up trophies for New Country Artist of the Year and Female Country Female Artist of the Year at Billboard Music Awards in Las Vegas. Tuesday, December 7, Gretchen Wilson was in Los Angeles to take part in announcing the nominees for the 47th Annual Grammy Awards. Gretchen Wilson received nods for Best New Artist (all genres), Best Country Album for her debut, Here for the Party, Best Female Country Vocal Performance for "Redneck Woman" and Best Country Song for "Redneck Woman." 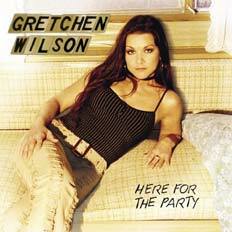 Gretchen Wilson "Here for the Party" CD: ORDER IT NOW. Has Gretchen recording Barracuda and if so where can I find it? It says "Ann and Nancy Wilson (no relation) of the legendary rock group Heart joined her on stage...", but according to Wikipedia, she is a third cousin to them. Can anyone tell me how to get a copy of Gretchen singing with Heart? She was awesome in this performance - but I cannot find a copy of it anywhere.